Daubert Cromwell offers the most comprehensive selection of VCI papers for industry. Papers treated with the safe, proprietary chemistry will prevent corrosion on the protected metals for years, without need for expensive coatings or ineffective methods such as desiccants or untreated barrier paper. 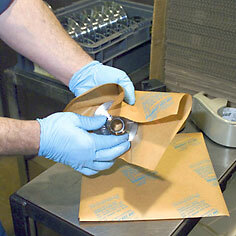 Simply store or ship the metal parts in VCI paper. Parts will stay clean, dry and rust-free. All Daubert Cromwell papers can be converted into sheets, bags, and wraps for individual parts; shrouds, covers and liners for large pieces or stacks of parts. Available in a variety of grades and weights for large, irregular, or smaller parts. Custom printing available with your logo for easy brand identification. Several Daubert Cromwell products feature special substrates that combine a rust preventive with barrier packaging. Available as barrier coated papers and films to protect against moisture and grease. Laminated grades afford heavy duty protection against the environment and serve as a rust preventive.